.... to Gregory Wolfe, editor of IMAGE, and author Kathleen Norris as they discuss her talk, "Remembering, Waiting & Hoping: The Countercultural Pursuits of Christmas." You can phone in or listen online ~ click here for the details. The discussion begins at 5:00 pm PST/8:00 pm EST. 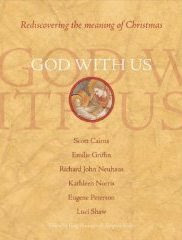 "God with Us: Rediscovering the Meaning of Christmas is a rich tapestry of a book, containing meditations for the seasons of Advent, Christmas, and Epiphany by some of the leading spiritual writers of our time, including Eugene Peterson, Kathleen Norris, Luci Shaw, Scott Cairns, Richard John Neuhaus, and Emilie Griffin. It also contains references for the Scripture readings for the day, original prayers, brief histories of the major feast days -- and is sumptuously illustrated in full color with masterworks of classic and contemporary art. There's even a red ribbon to mark your place in the book. 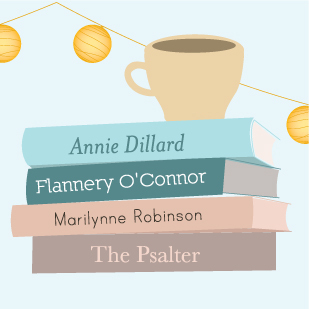 The authors take us on a journey of exploration into how the Christmas season unfolds the meaning of Incarnation -- the divine in the midst of the ordinary stuff of life -- and along the way they help us to better understand who we are as human beings. This book will help renew your appreciation for this hyper-commercialized holiday -- and would make a wonderful gift for those you love." I finally ordered our Advent wreath seeing as that beautiful season begins in just two Sundays. Johnny and I look forward to observing Advent in our home, and in our Church. Now, I must scoot upstairs and get to work so that I can listen to Gregory Wolfe and Kathleen Norris at 7:00 pm Texas-time.